Sometimes the night can be scary if you see a knight. 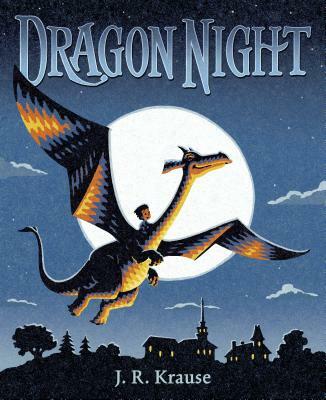 A great book about understanding and misunderstanding fear with a young boy and dragon coming together to find a way to be brave. The illustrations are rich with texture. Reminds me of one of my favorite bedtime books, Good Night, Good Knight. A boy and his dragon embark on a dazzling nighttime journey in this heartwarming friendship story about facing fears and helping others. Georgie is afraid of the night. It's too dark with the lights off. Too quiet with everyone asleep. And being alone makes everything worse. The dragon is afraid of the knight. After all, the knight carries a heavy sword, and he always wants to fight. The dragon knows just what to do to help Georgie overcome his fear, and the two set off on a unforgettable magical adventure. But when the morning comes, the dragon is still afraid of the knight. How can Georgie help his friend? With kindness and empathy--and a little creativity--maybe Georgie can work some magic of his own. J. R. Krause, an award-winning animator of The Simpsons and Futurama, has created a visually stunning story with incredible emotional depth, which addresses the needs of children to express their feelings and be received with kindness and empathy. J. R. Krause is an award-winning animator and designer. A graduate of the Rhode Island School of Design, he has worked on many television shows, including The Simpsons and Futurama. He lives in Southern California with his family. To learn more, visit jrkrause.com.